Being a professional wood-cutter, you have to use a chainsaw on a daily basis. A chainsaw is a machine to cut the wood with its set of teeth fastened with the rotating chain. Owning a chainsaw is not a waste of money. It has multiple versatilities in use. You can use it for chopping, removing branches from the trees, cutting the trees into logs, detaching certain parts of trees. A chainsaw often loses its sharpness for heavy duty use. Sometimes, its chain becomes barren staying unused for a couple of weeks or months. Whatever the reason is for losing the sharpness of the chainsaw, you need to get it back. It’s not recommended to buy another new chainsaw every time when it loses its sharpness. Do you have a chainsaw sharpener? If it is yet “No”, then you probably want to buy one. To maintain the maximum sharpness a chainsaw sharpener does the best thing you can ever think. You will be amazed to know the benefits of having a chainsaw sharpener. Owning the best chainsaw sharpener has its own peaks and perks. Let’s discuss them in details. A dull sharpening chainsaw is like a nightmare. If you are someone who has faced the blunted chainsaw cutting experience then you know the ruthless reality of suffering to cut wood. Cutting wood requires a time. But, what if it just grabs your whole afternoon time for struggling to cut a slender tree? The best experience you can ever get after sharpening your chainsaw is a faster cutting performance. The sharper is your chain, the faster you will be able to cut the wood. There is no time-consuming hassle to cut woods into logs within seconds. Whereas, a dull chain cause frustrated experience tending to cause bouncy wood which can waste some extra minutes to cut the same logs again and again. Who does want burn extra fuel to run a chainsaw? If your chainsaw runs on petrol, the less sharpen chain burns more petrol for cutting. In a meanwhile, it wastes expensive fuel and chain oil for running extra time. Do you want to spend extra money for the fuel? It is not necessary actually. All you need is to get the best chainsaw sharpener for saving your time. The sharper chain provides the fastest performance. The faster performance ensures the less energy power to use fuel. Burning less fuel doesn’t make you spend those extra bucks that you were spending till now. Is your chainsaw running out of sharpness? Do you need to run for a nearby garage to sharpen your chainsaw? This is not only a time-consuming thing. It interrupts the fluency of your work. You have to stop your work in the middle of cutting woods, and rush for the garage. Do you want to face this kind of interruptions in the middle of your work? The straight is “No one wants to face this kind of hassle in the middle of work.” You can really neglect this kind of situation when you only have a chainsaw sharpener. A chainsaw sharpener will make your life completely hassle-free. 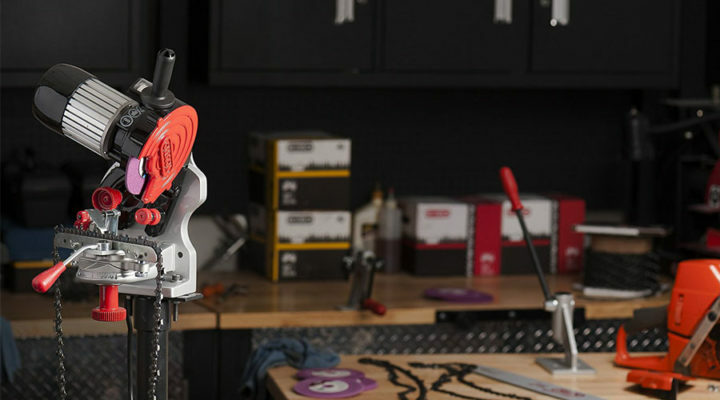 Among all the peaks of a chainsaw sharpener, you get the higher performance. A sharpener does its best to make the chain of a chainsaw working in an optimal way. It doesn’t put extra force on the motor. In a meanwhile, you get the more long-lasting parts as it doesn’t require any of the extra stress on the device. Most of the chainsaw accidents have been occurred due to a dull blade. Dulled blades tend to make the users weary and tired. As a result, their concentration level fades away for the maximum effort that he needs to provide to cut down wood. A sharp blade makes the cutting experience very light as the user can work with the minimum effort. In this way, the user will face accident rarely. There were some benefits of having a chainsaw sharpener. Now, are you thinking to buy a chainsaw sharpener? Then you just need to know how you will select a sharpener for the chainsaw. Before you buy a sharpener, you must know its flexibility. A flexible sharpener will give you the freedom to adjust the blades with the chainsaw comfortably. You can work with a flexible sharpener without any hassle. Make sure the sharpener is adjustable to work from any angle. You have to know how to change the angle. So, you can get the smooth work experience. There is some traditional sharpener which requires professional experience to sharpen a chainsaw. If you do not have professional knowledge then don’t go for the classical sharpener. It will disappoint you if you don’t have minimum professional experience. Whenever it comes to choose any tool, the smartness is buying the one which is easier to use. Along with the easy to use process, you must choose the sharpener which will perform different types of work individually. You have to use the sharpener blades to sharp chains multiple times. The easy process to use sharpener will be time-saving. As you have to use it before you go to the work, it’s a plus point if it is just so easy and simple to use. All the sharpeners aren’t designed to sharp multiple chains. If your chainsaw is built-in with multiple chains, then you must select an ideal sharpener to sharpen multiple chains. You have to act intelligently to check the units of the sharpener if it can sharpen multiple chains frequently. Different manufacturing uses different kinds of the operating system for chainsaws. Chainsaws tend to run on battery, petrol, or battery system. But, the sharpeners for chainsaws whether works manually or on electric or petrol running motor. There are also some chainsaw sharpeners which works by powering to the vehicle’s motor. You know what you would love to work on. So, depending on your requirement choose between electric or battery powered sharpener. A chainsaw seems like incomplete without a chainsaw sharpener. All of your cutting tasks are easier with a chainsaw sharpener. So, owning a chainsaw sharpener is a smart choice for the professional or occasional woodcutter.